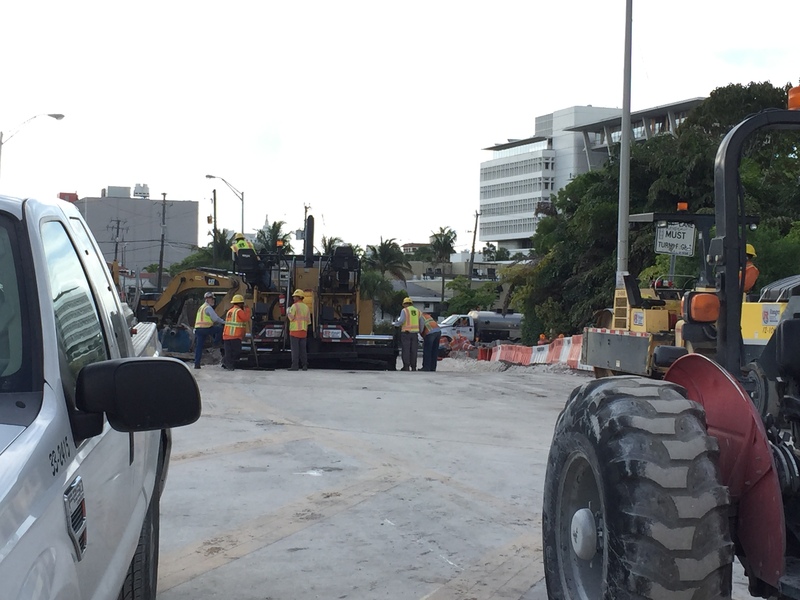 By Monday, the of Miami Beach says it will reopen one east and one west lane on 17th street between the 17th Street Bridge and Alton Road. So we’ll no longer have to detour to Dade Boulevard to make our east. But…..starting Monday night, the repaving of West Avenue between Lincoln Road and Fifth Street begins. According to the Florida Department of Transportation, this work will be done mostly at night. We’ll see what impact this has as the work moves forward. Workers race to open 17th Street to West Avenue lanes on Saturday. After more than a year of dread and delay, the Venetian Causeway link between the Venetian Islands and downtown Miami closes tonight — for at least nine months. The $12.4 million job means no Miami Beach to Miami access for Art Basel (December) and the Miami Marathon (February), Art Deco Weekend (January), the Boat Show (February), South Beach Food and Wine (February) and possibly Winter Music Conference and Ultra (March). It’s inconvenient for drivers, and a nightmare for bikes and scooterswho know the Venetian to be the quickest and safest path for them across Biscayne Bay. March 15, 2014. That’s the day when a chunk of the westernmost Venetian Causeway bridge gave way under the tire of Miami-Dade Transit bus. A month later, Miami-Dade County announced the structural deficiencies in the bridge were so severe that the span would have to be closed and rebuilt. At the time, Miami-Dade said the closure would begin in four to six months, and work would take nine months. Could some of the event impact have been avoided if the county moved closer to its original timetable? Maybe. But with nine months of construction, it’s hard not to impact a major attraction in an event-laden area like ours. There’s an interesting story by the Miami Herald’s Joey Flechas today that reveals that the contractor could get the work done before Art Basel — for $4.7 million more than the $12.4 million construction contract. It’s money Miami-Dade says it’s not willing to pay. Meanwhile, island residents prepared Sunday for their longer commutes, contractors worked all weekend on the 17th Street connectiion to West Avenue, trying to get it ready so drivers heading south to the MacArthur Causeway could avoid the detour to Alton Road. We’re all bracing for the months of inconvenience that start Monday when the westernmost span on Venetian Way closes for reconstruction. But we heard some decent news today from the Florida Department of Transportation: They plan to partially open the 17th Street bridge on Monday, so Venetian Isle residents can turn right on to West Avenue as we make our way south to the MacArthur Causeway. According to FDOT spokeswoman Heather Leslie, “one eastbound and one westbound lane will reopen on 17 Street between Dade Boulevard and West Avenue. The Venetian closure is expected to last about nine months. — On Tuesday, Feb. 17 at 6 p.m., the civic organization Miami Beach United is holding a discussion of how pedestrians, bikes and vehicles mesh (or don’t) on our roads and sidewalks — and how it could be better. The discussion, which happens at the Miami Beach Golf Club, 2301 Alton Rd., includes representatives from the city of Miami Beach, the transportation planning firm Gannett Fleming, and the street plans collaborative. — On Feb. 18 at 6:30 p.m., the city of Miami Beach is holding a session in Sunset Harbour to get neighborhood input on streetscape improvements in that torn-up area. As you know, most streets in Sunset Harbour are a mess, part of $5 million in improvements to replace underground pipes and utilities. The city engineer, Bruce Mowry, last week said the utility work should be finished by the end of summer, and then work will begin on the sidewalks, landscaping and road resurfacing. The neighborhood meeting, to be held at 1800 Purdy Ave., will give an overview and seek feedback on those improvements. — On Monday, Feb. 23, the city of Miami Beach and the Florida Department of Transportation will meet with West Avenue neighborhood residents to explain the major road project that will begin this week on West Avenue and 17th Street. The project, which ultimately will impact all of West Avenue from Fifth to 17 streets and includes putting in new pumping stations at Fifth, Seventh, 10th, 14th and 17th streets, involves raising the street as much as three feet. The meeting will start at 6 p.m., but the location has not been determined. We’ll update. WAVNA, the West Avenue Neighborhood Association, is coordinating with the city of Miami Beach.